I am not quite ready to do another tablescape. We are kind of in between seasons here. Or at least it feels like it. So I decided to organize and go through my tableware. Putting away the past holidays and trying to get out some fresh spring items. I had a thought to photograph some of my very favorite dinnerware and accessories. I haven't been blogging very long, just since last September. But I have been doing tablescaping for quite some time. I decided to post some of my very favorite items. 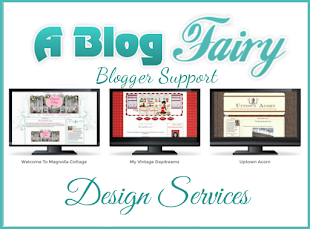 There are some repeats of what are in my blogs, others I have used on my tables but never blogged about them. 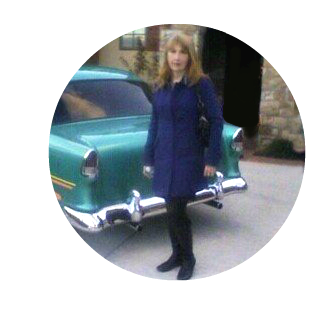 If you click on the photos they will enlarge for a closeup view. 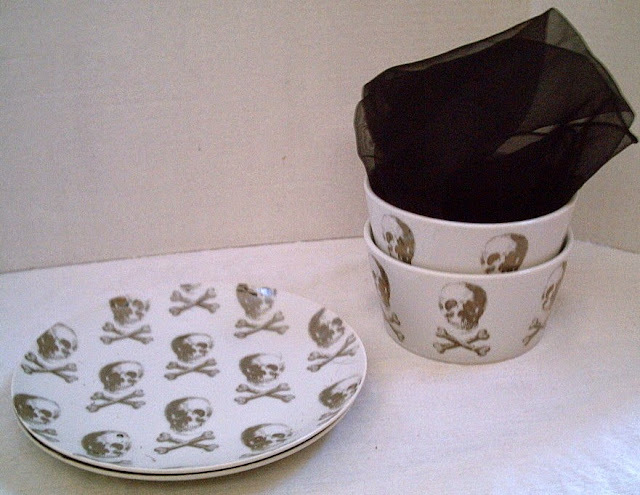 Of all the dishware that I own for some reason this set is my favorite. I have it in a blue colorway as well. This color, is my favorite. The dishes remind me of Mackenzie-Childs style. They are so whimsical to me. They make me happy just to look at them. They were from the grocery store. Smith's Marketplace a Kroeger company. Made from ceramic. I really love the embossed basket design and I love pink. This plate has a charming vintage feel to me. 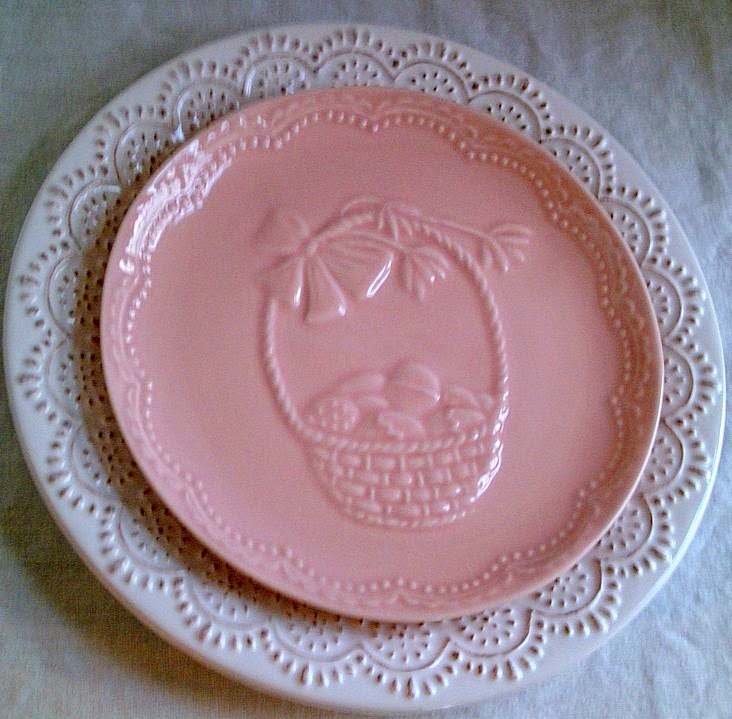 The pink plate was from World Market. 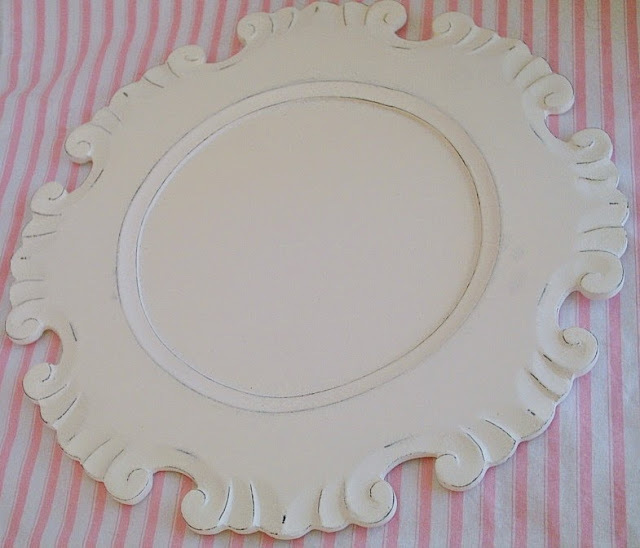 The white plate which has a similar design on the edge is from Smith's Marketplace. I love Easter Baskets of all kinds. 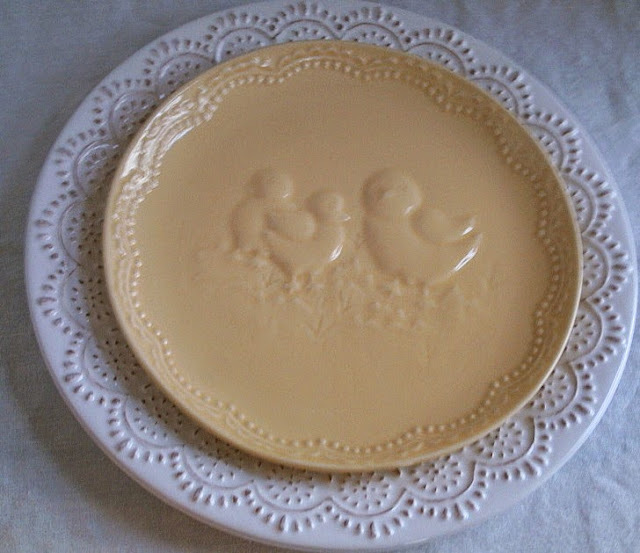 The adorable yellow little chick's plate is from World Market. Anything with swans always appeals to me because for one, I think of the Swan Lake Ballet. Our family has quite a history with dance. 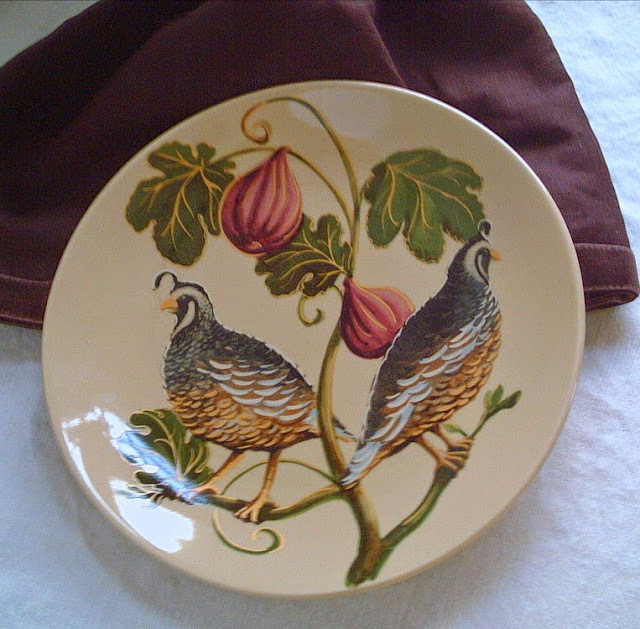 From Pottery Barn the quail plate and plum color linen and velvet runner are my Fall go to dishes. 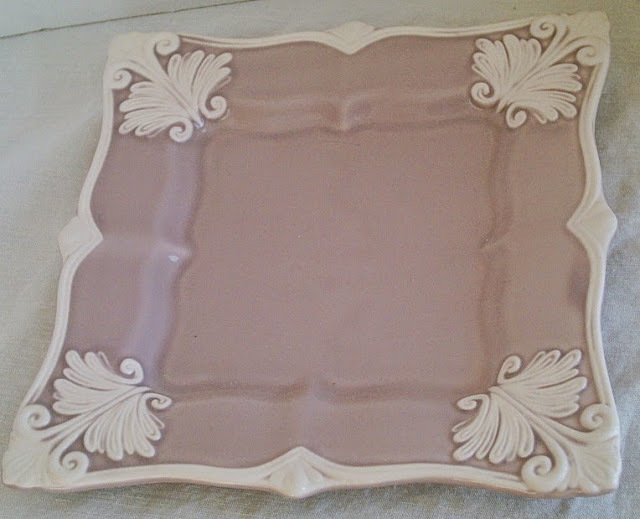 The plates have some plum in them and it blends so nicely with the runner. 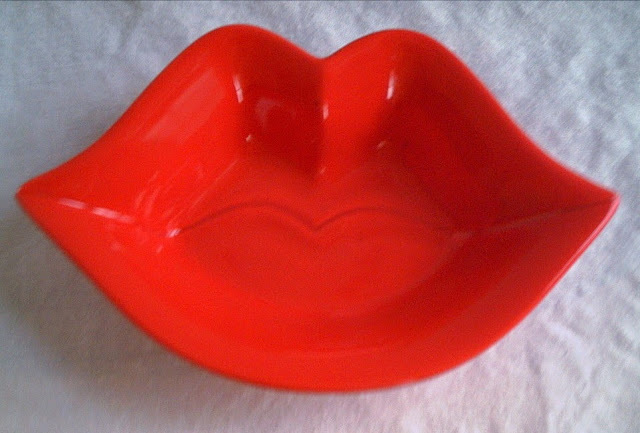 You have seen the Red Lips Bowls from Tai Pan Trading in a Valentine Tablescape I did. The moment I saw them I fell in love. They are food safe and are great to serve a wonderful salad in. The "I Choose You" salad/dessert plate is so lovely to me. From Crate and Barrel. Great message and a beautiful design. 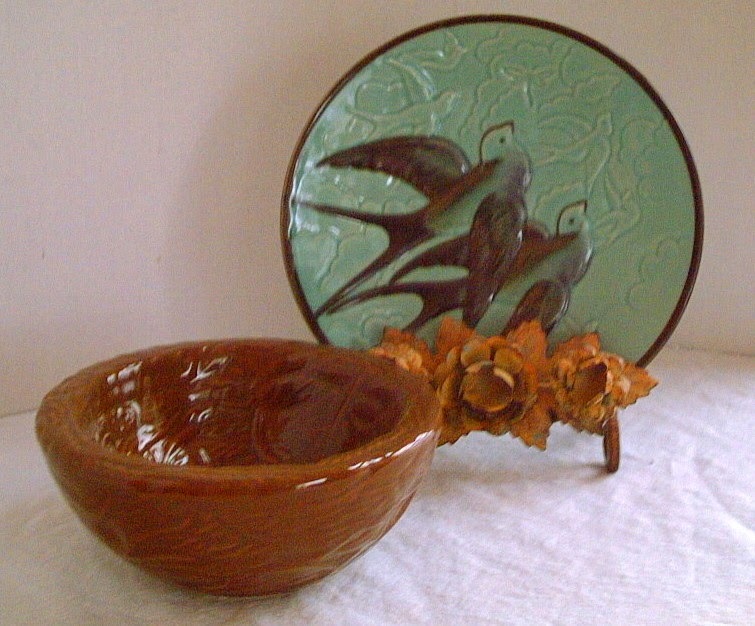 I have had the bird plate and nest bowls for a long time. 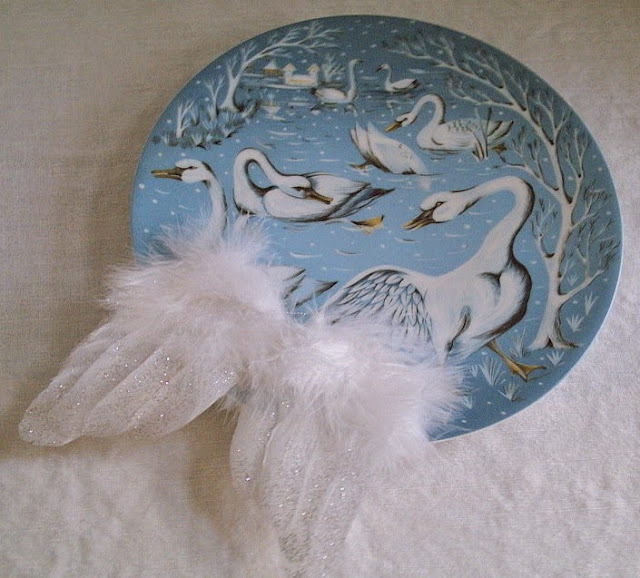 When I set up a table with them I actually use the bird plate as a bread and butter plate. Before we sit down I keep it on the stand and place the nest on a dinner plate. The little plate stand has shades of the same green on the flowers. Plate and bowl from a store called Details. The stand from Thanksgiving Point Emporium. 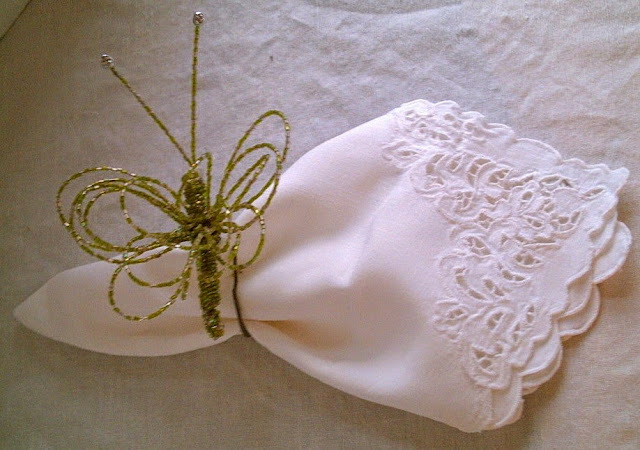 Below I have a large green beaded Dragonfly as a napkin ring. It is quite large even though the photo doesn't show the true size. The napkin is from Seferra I picked it up in Portland, OR. I was there for a week taking some Floral Design courses. Napkin ring from a store in Park City, UT. I love the deep embossing on the Crown plate. I see these plates everywhere. The small Crown plate which is food safe was from World Market. 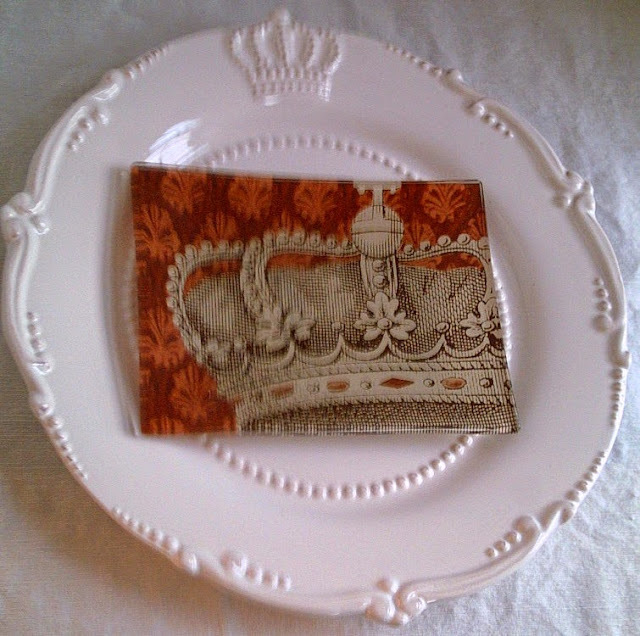 I love the unusual artistic design of this plate in that it shows just a partial picture of a crown. The turkey plate purchased from Pottery Barn a few years ago is one of my favorites. I love the deep rich gold color. I love the color gold for Fall. Don't you? 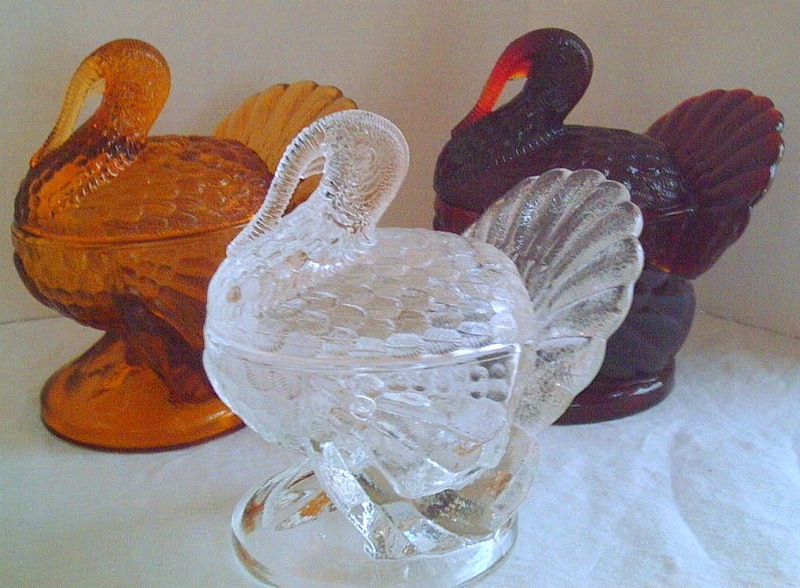 Loved these turkey's when I saw them at Williams-Sonoma years ago. They were made for them by the L.E.Smith glass company in Pennsylvania. I actually ordered most of mine direct from Smith Glass as they gave me a great deal on them. Gold is my favorite. I have 8 gold and 8 clear. I have just 4 in the red. 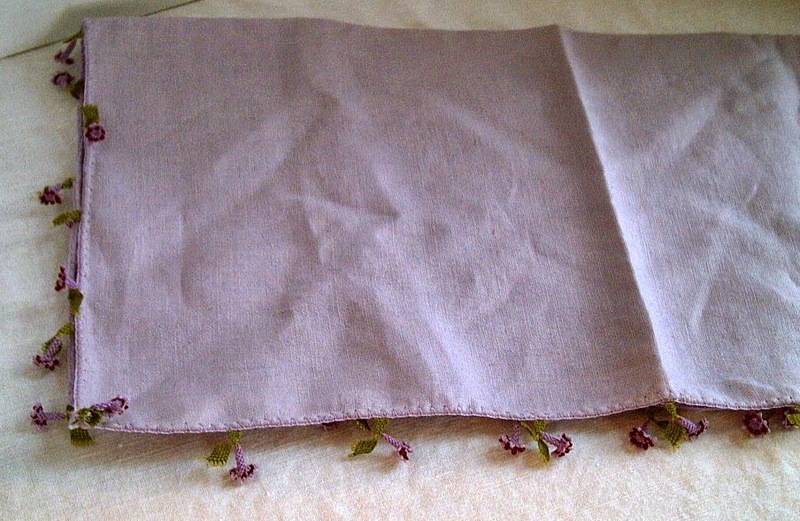 The lavender napkins are from a store called Amen Wardy. I purchased them in Las Vegas at "The Caesar's Shops". No longer there but I think there is still a store in Aspen, CO. 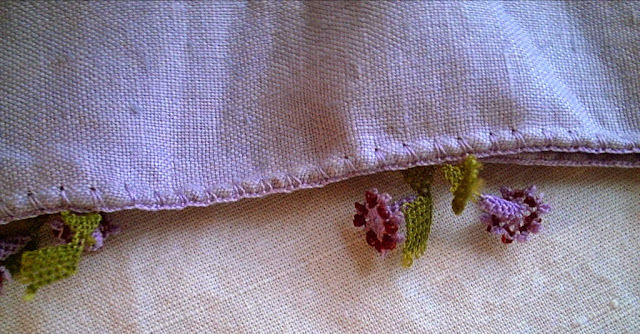 I loved the little flower crochet around the edge. Made from linen, so please excuse the wrinkles. I didn't iron before photo was taken. I actually do enjoy ironing. Pink and brown chocolate set. What's not to love. The colors are unusual together as far as dishware is concerned. 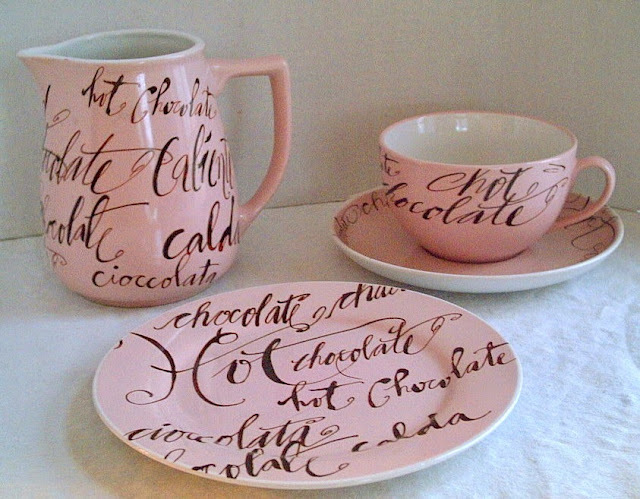 With chocolate written in different languages in an all over pattern. Great for a chocolate bar or dessert night. I like eating from oval plates at restaurant's so when I saw these oval plates just perfect for a dinner size plate I bought them. 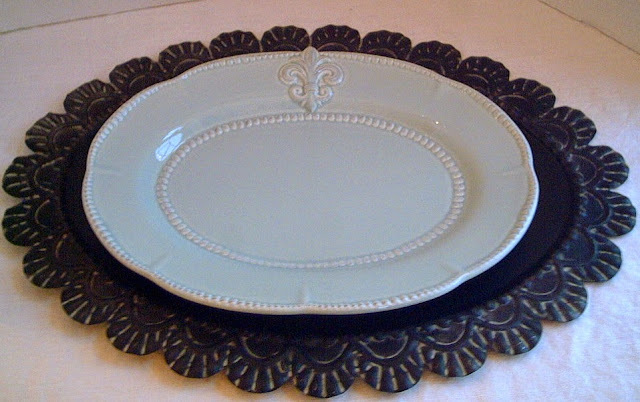 Done in a Robin's egg blue with an embossed fleur de lis. 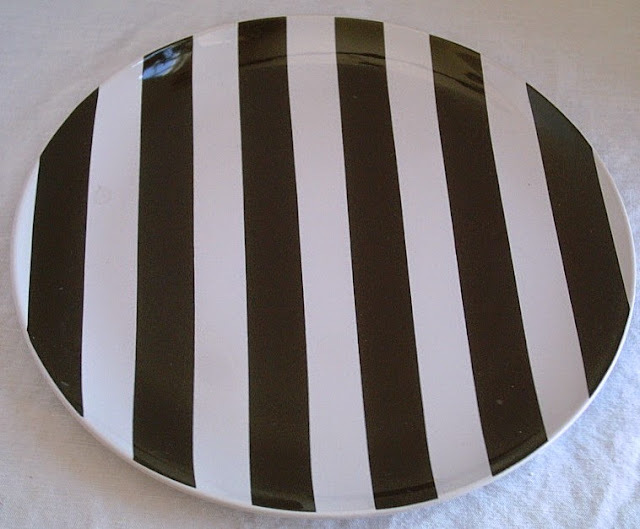 I wanted an oval charger plate, which was hard to find. But when I saw the metal oval charger plate I thought it would be perfect. The secret is that the charger plate is really not a charger plate at all. It is a small chalkboard! The blue plate is from Tai Pan Trading. The chalkboards came from Thanksgiving Point Emporium. 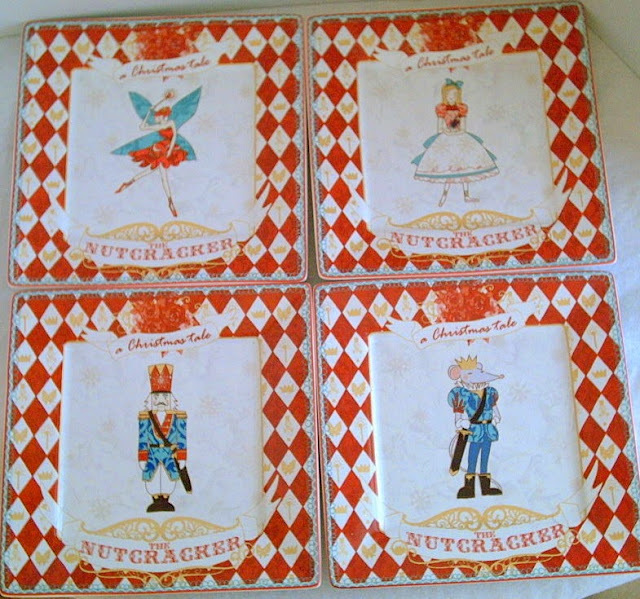 I really fell in love with these charming and whimsical Nutcracker Ballet plates. They were different than any I have seen. I used them in a tablescape on my blog. They are one of my favorites. A lot of my family is involved in the Ballet world. I am not sure who I should give them to one day. I collected the St. Nick plates from Williams Sonoma. Each year for about 7 years they would feature a different design. 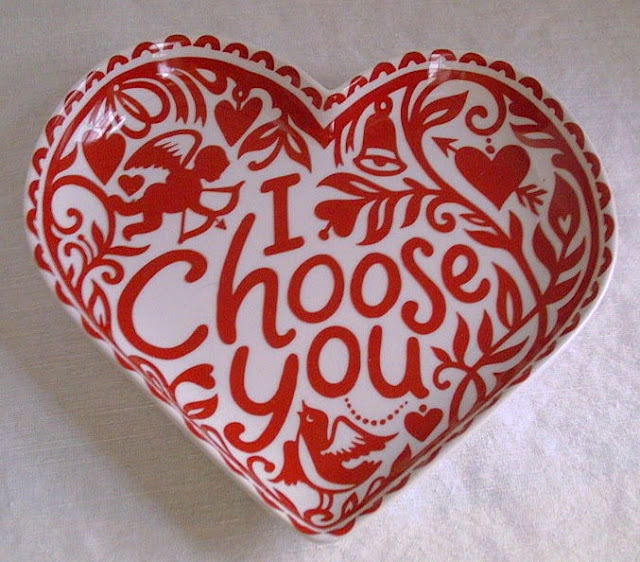 I loved the English transferware. Everyone thinks they were all from Spode. And when Spode fell on hard times they could no longer produce for Williams Sonoma or anyone for that matter. The company has since restructured itself but the red and white version is no longer available. But back to what I said that people think Spode did all the year's of dishes. The first year plate, which is on the bottom right was actually made for W.S. by Wedgewood. 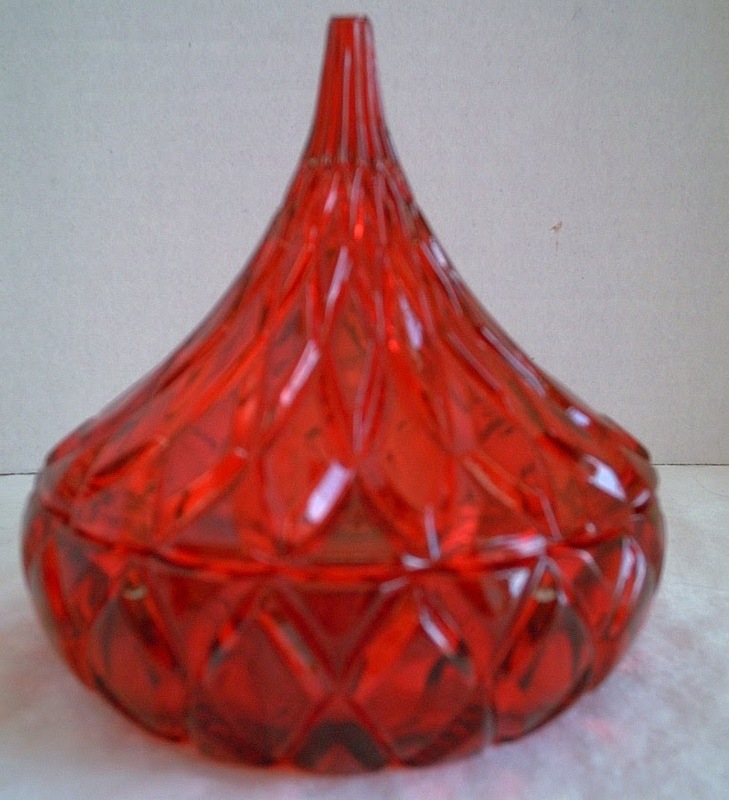 I used the red crystal Hershey Kiss this year on my Blog for a Valentine's Day tablescape. Measuring about 5" tall I thought it would be adorable to set on the top plate. I had thought they were so charming for years. I purchased mine at Macy's, as they had the best price. It is one of my favorite's. So many blogger's and my friends have these chargers from Pier One. They are my very favorite that I own. The are so intricate looking in a plate stack, they really add to the overall look. For some reason I love love love these black and white stripe plates from IKEA. They are a full size dinner plate. I used them in my Pirate tablescape. But, you could use them in so many applications. Only limited by you imagination. I like glass in all its shapes and forms and have adored the bunnies for years. I have purchased them all over the place. 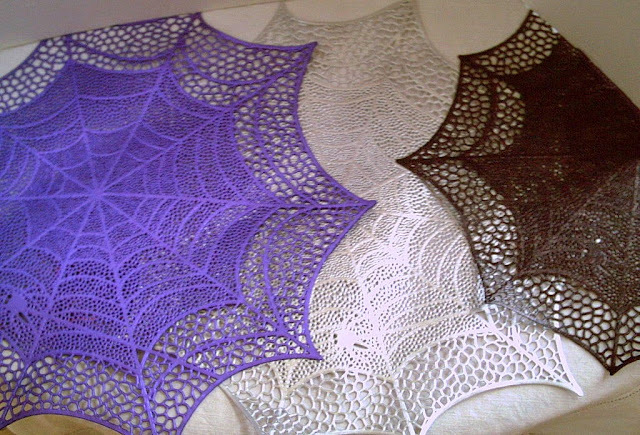 I have some larger ones that I bought from L.E. Smith glass, but I love these smaller ones. Putting them at each individual place setting. My favorite ones are the purples. 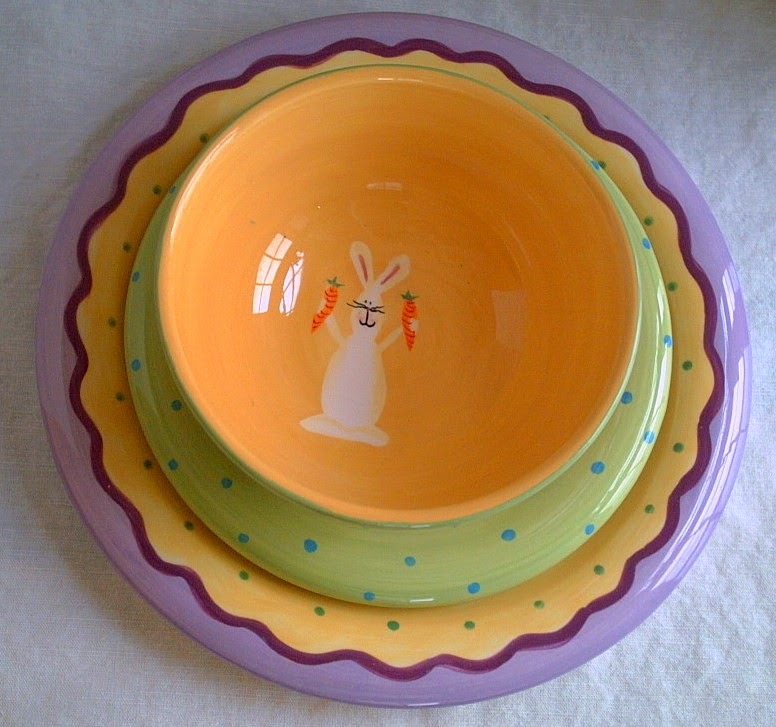 I have used the rabbit luncheon plates every year. Purchased directly from L.E. Smith Glass. They are a great size of 9". 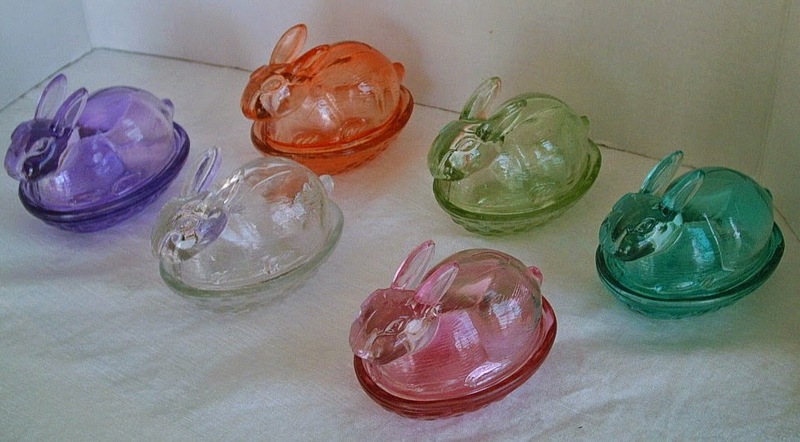 The larger glass rabbit is from Smith Glass as well. Wings, wings, wings. Angels, cherubs, fairies, and birds. I have been able to use them quite often in my tablescapes or a floral arrangement.. 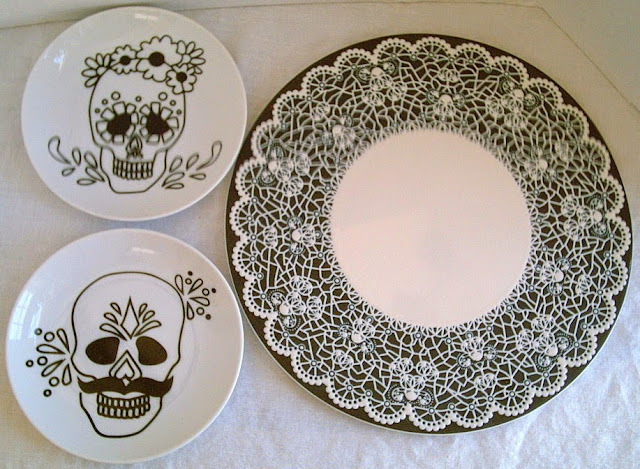 I purchased the Dia de los Muertos or Day of the Dead porcelain plates from Crate and Barrel just last year. I used them in the tablescape of the same name. 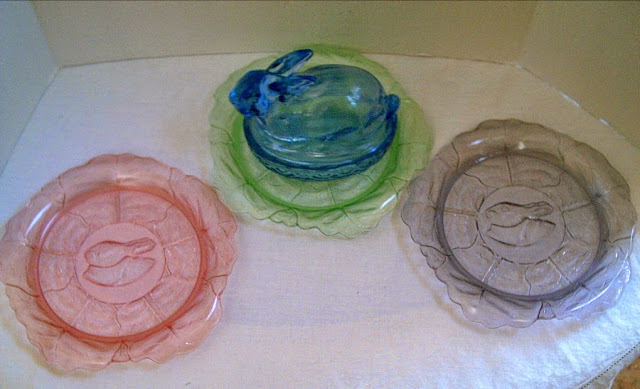 The large plate on the right is what C&B calls a cake plate. My purpose was for a charger plate. Photo below just shows the plate stack. 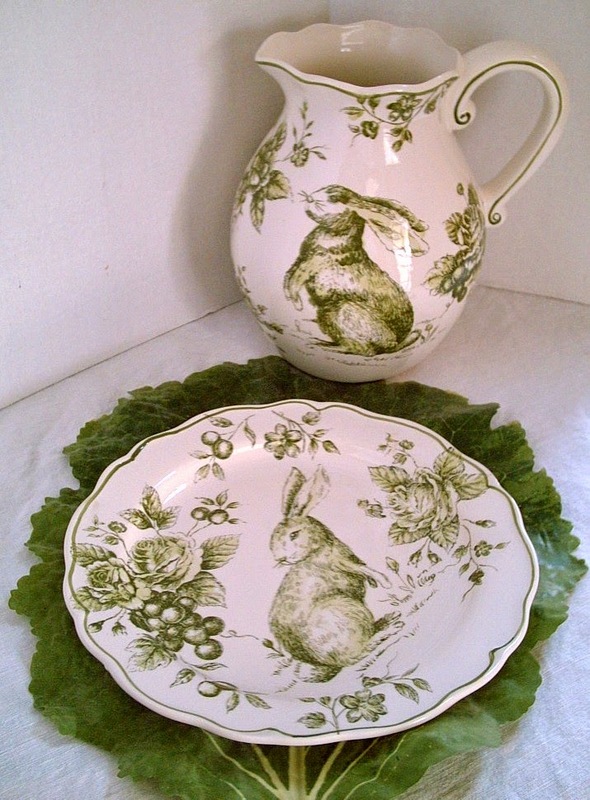 When I see my green Bunny Toile it helps me have a new and fresh perspective. I sometimes use my cabbage leaf placemats. I love the company that manufactured the vinyl spiderweb placemats. The are so detailed and I love the pierced style. The finish color is metallic and makes them really stand out. Skull and Crossbones from Z Gallerie. Great for any Halloween Theme. The skulls are a darker silver metallic finish. This Frankenstein is adorable and whimsical. I love him for Halloween. 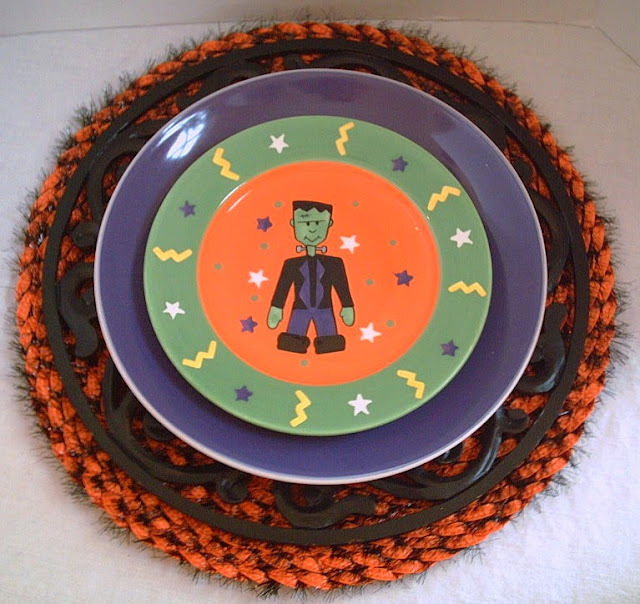 The pedestal bowl and salad plates I have to match are unusual colors for Halloween. 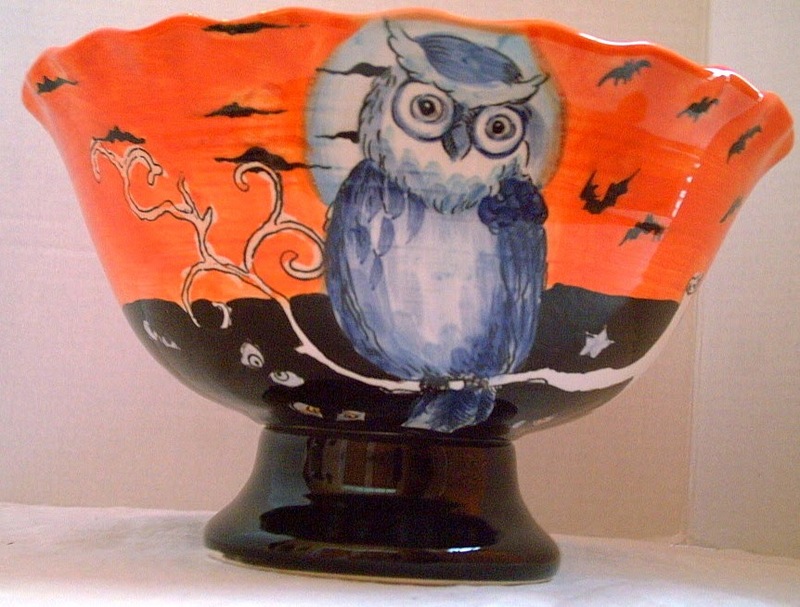 I love the blues in the owl. I am always looking for something out of the ordinary. bored. Thanks for taking the time to look. Please feel free to make a comment. Thank You. I will be posting this on Tablescape Thursday @ Between Naps on the Porch.I'm participating in Tablescape Thursday at Between Naps On The Porch. You have quite the collection of table settings. I love, love, love the Dia de Los Muertos plates. I bet it is so much fun setting the table at your place :-) Thanks for sharing and thanks for stopping by for a visit. Wishing you a wonderful new week. I really enjoyed looking at all of your goodies here. 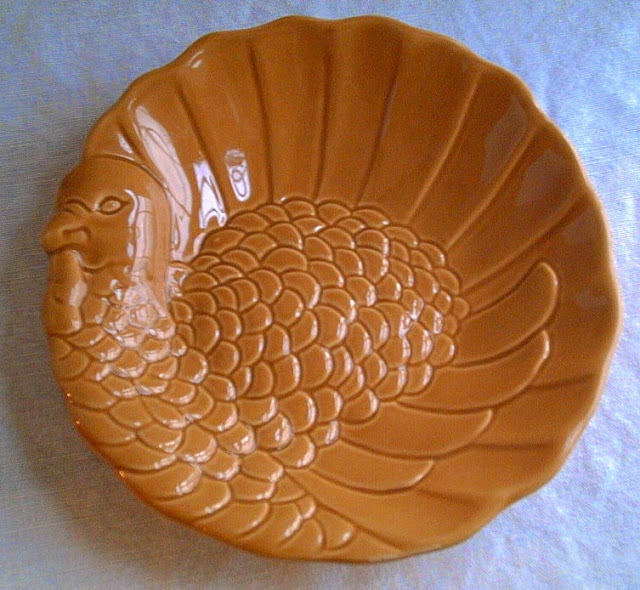 I have the same Pottery Barn turkey plates in white, and have a set of twelve of the clear turkey dishes. I bought them years ago before they quadrupled in price. 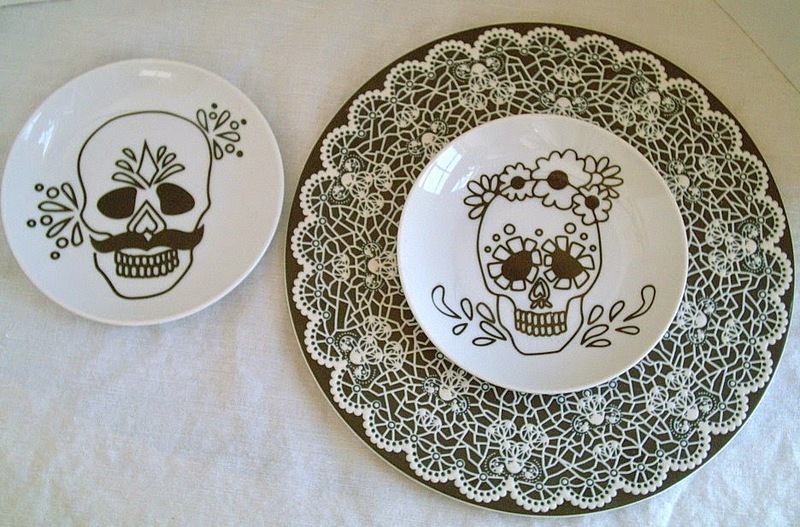 I am head over heels for your Day of the Dead plates! Despite there being a local shop, I just never seem to get to Crate and Barrel. I think I need to remedy this soon! We have so many of the same things! Isn't that fun?!! I can tell you have been collecting for a while because many of our things aren't available anymore! I loved seeing your favorites! You do have some really fun pieces with which to be creative. I can see lots of opportunity here. 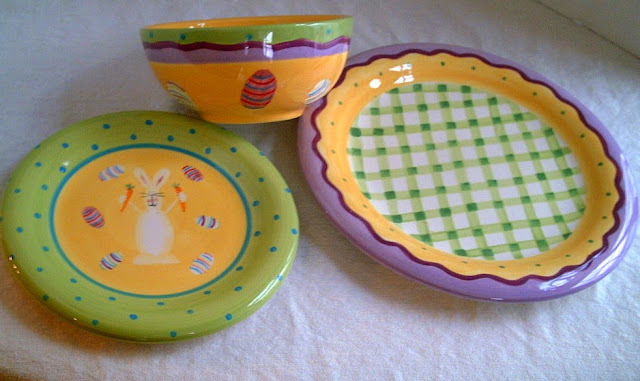 Such a variety of pretty and fun dishes! Now I want some oval plates, and those chalkboard chargers are so clever! 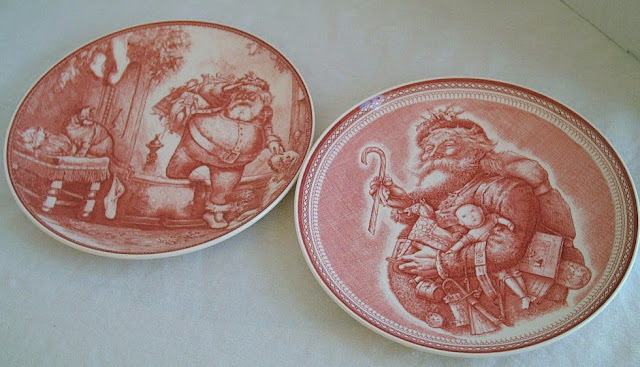 I've always loved those transferware Santa plates. What fun H'ween plates you have. Thank you for your nice comment on my Mardi Gras table. You asked about the tassels I used. I should have told that story in my post. At an estate sale, I found a large box of Christmas decorations. I purchased the box without knowing what was in it. Apparently, they had done a Fleur de Lis Christmas one year. Hi Valerie, you have many lovely dishes. It's so fun to find some awesome dishes, expecially when they are on sale. Your bingo tablescapes is an error, page not found. Any more thoughts on a blog design?